(2XL) BIG MAN Vintage 70s Xmas Shirt! Red, Green, Yellow, & White Plaid W/ Cream Corduroy! 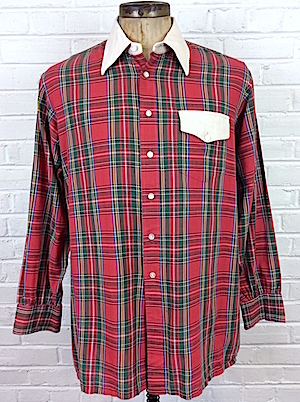 Home > 1970s Disco Clothing > BIG MAN Clothing (2XL +) > (2XL) BIG MAN Vintage 70s Xmas Shirt! Red, Green, Yellow, & White Plaid W/ Cream Corduroy! Mens vintage 1970s Christmas disco shirt! 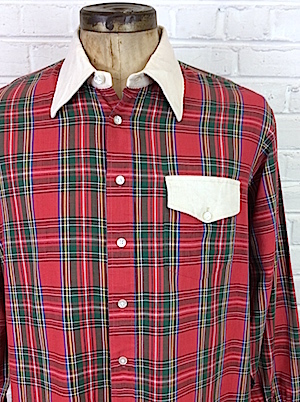 Get funky this holiday in this vintage red, white, blue, yellow and green plaid shirt! Has a super wide & super pointy disco era collar in a cream colored corduroy. Closes in the front with pearly white buttons with one matching button on each cuff. One pocket on the chest with a cream colored corduroy flap closure that is secured with a button. Shirt has a straight hem. Tagged the King Size Co.